The table topper was done this Saturday, and the 4 place mats got finished this morning. I am one day behind my schedule. I wanted to have these in the mail yesterday, but we had a bad storm come through and the power kept flickering, so I turned off my sewing machine. It is plugged into a spiffy power supply, but since the machine costs more than I can afford to replace right now, I decided to not risk it getting fried and turned it off. But with priority mail, these should still arrive in TN in plenty of time. These will be going on a white table, and will look way better on that than my wrinkly blue table cloth. I have an iron, but since I have no plans of quilting the table cloth, it gets to stay wrinkled. Besides, with 4 kids and one husband, the table cloth wont stay clean long and will end up back in the wash in a day or too. 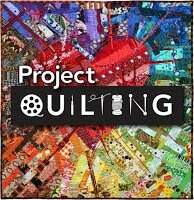 I am really inspired by your quilting. You have a good eye and knowing you did these things on a domestic machine makes me believe I can do that too! Gorgeous! I love the colors you chose for your table topper. It will be a wonderful addition to any tabletop.